Associazione Sportiva Roma (BIT: ASR, LSE: 0DMN), commonly referred tae as simply Roma, is a profeesional Italian fitbaw club based in Roum. Foondit bi a merger arrangit bi the Fascist regime in 1927, Roma hae pairticipatit in the top-tier o Italian fitbaw for aw o their existence cep for 1951–52. 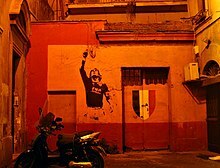 Roma haes wan Serie A three times, first in 1941–42 then in 1982–83 an again in 2000–01, as weel as winnin nine Coppa Italia titles an twa Supercoppa Italiana titles. On the European stage Roma wan an Inter-Cities Fairs Cup in 1960–61, comin close tae European Cup victory in 1983–84, an feenishin as runners-up in the UEFA Cup for 1990–91 (twa-leggit aggregate defeat agin Internazionale). Wikimedia Commons haes media relatit tae AS Roma. This page wis last eeditit on 11 November 2018, at 19:03.